Although some of my information back in September was off-mark (writes David Kilpatrick), the post which I put up here was definitely right about the new A7 or rumoured ‘full frame NEX’ being based on the RX body design. I gather it was not the Alpha division, or the NEX division, which handed the prototype cameras to photojournalists from Magnum and Panos agencies. It was either Sony management at an even higher level, or the Cyber-shot division. The photographers involved had previously been using the RX1. 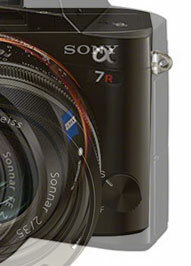 They were given the pre-production A7 as a development of the RX1. It may even have been produced because Sony got the feedback that an RX with interchangeable lenses would be great. Both cameras are deceptive; you simply don’t expect this image quality out of something that light. It’s not like carrying a Leica, where you’re wielding something that might double as a weapon – the magnesium body and full-frame sensor feel solid yet after carrying my regular full-frame SLR, it’s a genuine shock. The Zeiss lens on the Alpha 7R I used, the 55mm F1.8, looks to be exceptional. When first looking over the JPEGs, I went straight to the corners – the clarity, the even illumination, just instantly impressive. The kit lens I didn’t spend as much time with, and I tried it on the 24Mp Alpha 7 mostly investigating the AF, but I would be opting for primes anyway on this body. I’m curious to see how it handles Leica M-targeted lenses – there will undoubtedly be a 15mm or similar, but one of my favourite inexpensive lenses on the M9 was the Voigtländer Super Heliar II, which showed dramatic falloff and magenta tinges in one corner on that full-frame CCD. It was possible to correct, it seems Sony’s work on short registration full frame may be extremely successful, or their lenses are very well matched. Either way, it works. I’m not very familiar with Sony’s user interface, and I found some controls slightly unintuitive – on this pre-production model, I couldn’t change the ISO whilst the file was being written. That’s the sort of thing which if I’ve left it set to Auto, or simply hadn’t been paying attention between uses, I might want to do – noticing an incorrect exposure and wanting to rapidly correct my error and reshoot. Other areas of the UI impressed. The animations for aperture and so forth as you adjust the wheels are quick, clear and unobtrusive, whilst still providing the feedback that would allow less experienced users to see which direction they’re heading and what options are available. The main screen is very nice. Sharp, and I’m a big fan of articulated screens that allow the use of a camera in a “waist level finder” format. Felt solid, robust enough to cope with professional abuse. Card door and battery compartment aren’t combined, which is a bonus on a compact body. It also has a well sculpted grip. Perhaps it’s unfair to make direct comparisons, but let’s say I prefer this sort of body design to the flatter, more ‘retro’ inspired mirrorless options on the market. Can not mention this enough, it’s tiny. It’s properly tiny. Not tiny like “well, it’s as big as a classic SLR from X manufacturer, but it’s packing a tiny sensor in there” – it’s “35mm film era compact body” tiny. With a proper, serious sensor in it, the design compromises to achieve a digital, high-tech UI in a small form factor feel like a much better trade than if you’re working with small controls and sacrificing sensor area. Port covers are hard plastic, hinged, a bit annoying (rubber ones will at least bend if you catch them by accident). Again, lack of familiarity with Sony catches me out here, as the accessories I’d often expect to hook into the ports use the hotshoe accessory port. An adaptor for the earlier hotshoe is available and about £25 apparently, I was more concerned that I wouldn’t be able to use a regular wireless trigger and thus finding a conventional – albeit very sophisticated – hotshoe was reassuring. I wonder how many regular professionals share that perception – that there will be a non-standard interface on the Sony body. Shutter sound is very solid, mechanical. A really nice sound. There is not a fully electronic shutter mode available, so no silent shooting, but it’s discrete enough. Ergonomics are really good. The wheels are logical, I found my way around it very quickly on the whole, though without the experience David has of Sony’s software I didn’t know where to find specific features right away. It was logical enough for the main features, such as setting file size and type. There’s an optional battery grip, though it’s really not vital for changing orientation – the camera is so light, one handed shooting and quick rotation is easy. I am not a fan of EVFs, though I’m happy to work with them if that’s what I’ve got, an optical viewfinder will always be my preferred route. That said, the EVF really did impress. It’s very sharp, has an impressive refresh rate and of course, somewhere there’s a lot of data being shifted to generate that 2.4Mp image. Cannot deny the technical accomplishment! The overlaid virtual horizon was useful and unobtrusive, though I wasn’t clear on what focus point I was using due to my lack of familiarity with the interface. Sensor exposed when lens detached. This is common on mirrorless bodies, but I’d really like the option for the shutter to close when detaching a lens. Pros do not treat their kit the way an enthusiast or amateur will cherish the substantial investment – the job, be it on sandy beaches, muddy fields or pouring with rain at a wedding, must take priority and the cameras and lenses get subjected to abuse. I want one, in an abstract way. it’s really very nice. To expand on that – I’ve a feeling when I see what the finished firmware and raw files offer, and have had more experience with the Zeiss lenses in particular, the shift to an EVF is a change I’d willingly accept for the size and quality advantages, but it’s also just a lovely bit of design. Really appealing. Sony want to move to pro market. Sony have pretty much always had good glass and bodies, but this offers something really unique that should appeal to many professionals – not least because of that 36Mp sensor. That it should use the NEX E-mount (already used for full frame on the VG-900) was never in any real doubt, though other prototypes may have existed using a different approach. 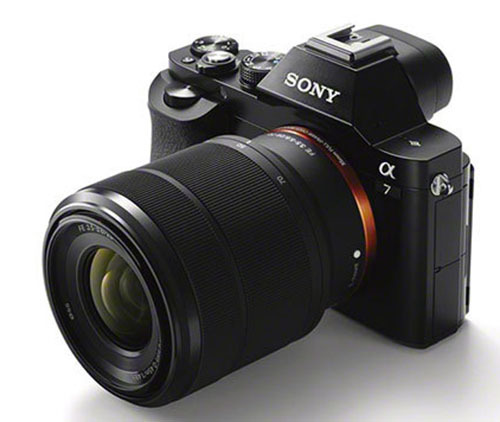 Today, worldwide, the A7 (24 megapixels full frame with Phase Detect focusing pixels on the sensor) and the A7r (36 megapixels without PDAF, but with AA filter) were officially announced. Compare the body here with the RX1 below – and make a special point of looking at the film plane index mark on the left-hand top plate end. 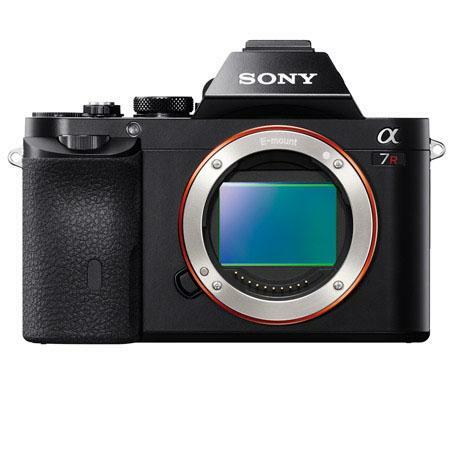 You’ll see that the sensor is positioned much further forward in the A7 body, as the FE mount has the same 18mm register as the original E-mount (including the RX-style decorative orange lens throat bezel) and the RX body is thicker than a NEX even before this is added. This enables a flush-mounted double hinged rear LCD screen, but it’s not a fully articulated or reversible screen, which is a pity. You will also see that the entire body has been extended in length, despite the RX being full frame. This is necessary to accommodate the mechanical drive for the focal plane shutter, which sits more or less between the lens and chunky right hand grip (the RX has no FP shutter as it uses an interlens design). All other principal aspects of the A7 stem from the RX design but the construction is not the same, with multiple magnesium body components sealed together and a different set of interface covers. The cameras include WiFi and NFC (NearField) communication to enable cable free transfer of images. It does not have built-in GPS but a GPS module is expected for the Multi Function Accessory shoe. The cameras have 2.3K dot 0.71X 0.5 inch OLED EVFs, essentially the same as the A99 with a similar generous eyepiece size and auto switching. There also appears to be some extra depth to the body. You could dream that the extra body depth, length and height conceal the required mechanism for in-body stabilisation… but it’s just what is needed for the focal plane shutter. We had hoped that the 35mm f/2 lens would be replicated, but this was not to be despite some information that the 35mm being used on prototypes was ‘the same’ as the RX1. Instead, there’s a 35mm f/2.8 Zeiss. I will admit to being underwhelmed by that, as it puts the A7/A7r into a category which almost every camera ever made matches (very few cameras can’t achieve a 60° view angle at f/2.8 – it’s what the cheapest compact 35mms used to start with). It is not stabilised. One zoom lens also announced – a lower cost stabilised(?) Sony G 28-70mm f/3.5-5.6 – also fails to set the heart racing (or the hands racing for the wallet) when you consider its modest aperture and fairly substantial size. Unlike the 35mm, it has a rear ring which is marked for aperture adjustment like the RX1 (silent or clicked at choice). The FE mount, while compatible with existing E-mount lenses and accessories and has the same ten-pin contact array, may have additional protocols to handle the on-lens aperture setting. The 28-70mm zoom is not a true parfocal, it’s similar to lenses such as Canon’s 18-135mm sold with their EOS 70D which almost negates the value of on-sensor PDAF by having massive focus shift when zoomed. If you want contrast detect focus to work, you need parfocal zooms. You need to keep the subject as close to being sharply focus when you zoom as you possibly can. This zoom does not have a constant aperture though setting it to f/5.6 or smaller may have that effect, and it has a large varifocal range (closest focus at 28mm is 0.30m, at 70mm, it’s 0.45m). Looking at this, I feel that the 24-105mm Sony f/3.5-4.5 D I’m using on my A99 has real appeal. This shot shows a Carl Zeiss 24-70mm f/4 OSS lens, not a kit lens, but an option at a high price. This is a more realistic range. My guess is that this lens will not only be a constant aperture (regardless of setting) but also parfocal so zooming during video will not force a refocusing process. 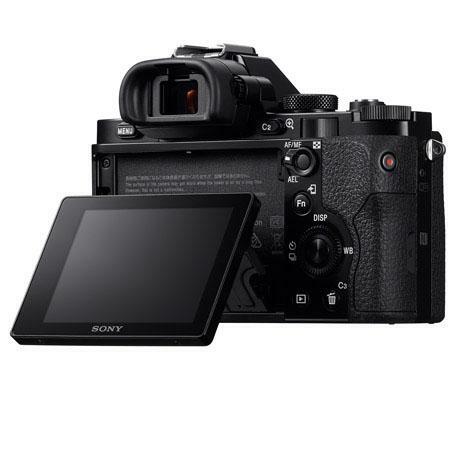 The A7 models have audio manual level control during video and a conventional 3.5mm jack for mic input, clean HDMI output for professional external recorders, and for stills only (not video which remains 1080 50/60 or 25/24p – there is no 30p option) the camera will play back at 4K resolution for the new Triluminos gamut Sony 4K televisions. The final lens of those released with the camera is a 55mm f/1.8 – again, a slightly odd choice for an expensive standard angle lens of reasonable speed without being special. Bear in mind all these lenses are weathersealed and built for professional use, with the kind of smooth focusing and aperture control required for video as well as stills. A 70-200mm f/4 is also released, putting a total of five lenses in the showcase for launch despite the absence of a true super-wide. A brand new LA-EA4 Alpha mount lens adaptor provides phase detection AF via an SLT mirror, and has sufficient clearance internally to prevent image cut off (the LA-EA2 casts a shadow on the sensor as it has a smaller throat). A new 70-200mm SSM G II A-mount lens has been launched today as well as is picked out by Sony as compatible with this adaptor. For most potential buyers, the preview of many other lens adaptors – for Leica and for Canon, as examples – will not just be an added attraction, it will be a essential function. It would be interesting if the FE-mount allows adaptors with their own aperture ring controlling lenes such as Nikon G, and reporting EXIF correctly to the A7’s CPU. That kind of detail we’ll have to wait to learn about; most early reviewers will have other concerns. Adaptors are vital because this camera is launched in sharp contrast to the original NEX-5 and 3 models, with at the best a semi-wide prime lens and a basic wide angle on its zoom. The NEX system set off with a 24mm lens equivalent, an 84° angle of view considered to be the most desirable all-purpose wide angle, in the box. The NEX SEL 16mm f/2.8 may have had its critics and its QC problems, but it’s become a much-loved lens and got hundreds of thousands of NEX owners off to a great start needing no other wide angle lens. It also had the 12mm wide and 10.5mm fisheye adaptor options at modest cost, meaning that those who wanted true wide views had no reservations buying into the system. 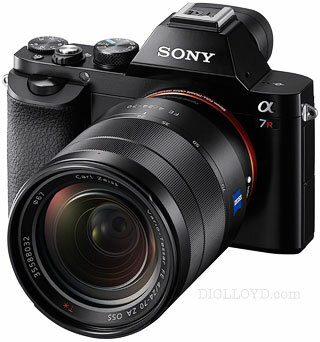 The A7/r is in sharp contrast to this, without no prime in the launch range shorter than 35mm. Professionals would definitely want to have a fast 24mm (and a faster 35mm!) and a geometrically good 20 or 21mm. The Leica 21mm Super Angulon was almost the standard lens for photojournalists from as long ago as 50 years, reaching a peak of popularity in the 1970s, still considered vital when you’re in a tight situation with crowds. 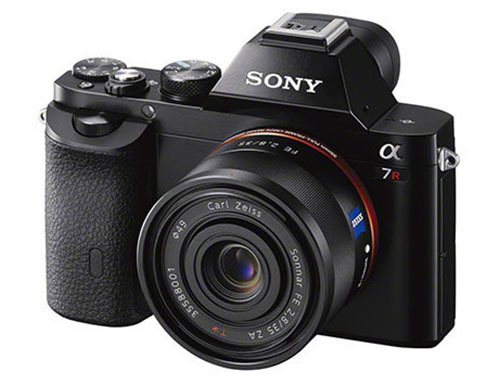 The A7 is an incomplete professional tool until it has a moderate sized, f/3.5 or f/2.8 20-21mm. Vignetting is acceptable as long it’s not accompanied by a colour shift. Vignetting actually helps with the look of the images! The A7r with its D800 level resolution (but a sensor not related to the D800) has the AA filter removed, as in the RX1r. I have tested the RX1r against the RX1 for the British Journal of Photography and I’ll write here about the whole issue of AA filters and moiré only after the BJP has published my report. I will say that the moiré is not a minor issue, the RX1 standard version is already capable of throwing up moiré as it has a very weak AA filter, and the RX1r is bitingly sharp. So why does Sony do this? It’s hostile to video though the scaling down from the 6000 pixel sensor to a 1920 pixel HD frame is accompanied by moiré removal. The answer lies in conventional contrast detection autofocus. AA filters reduce fine detail contrast and tend to smooth the luminance peaks and troughs used by contrast detect focusing to decide when the image is most sharp. Removing the AA filter has a small but significant effect on the speed and accuracy of contrast detection focusing, along with an improvement in many irregular textures like distant woodlands, lawn grass and human skin. So if you incorporate image processing able to remove some of the resulting moiré, it makes sense. This is the route being taken by most other makers now to get the best possible live view auto follow-focusing. The A7r sensor has a sensitivity of 100-25,600 expandable to 50, and to 51,200 with multi-frame noise reduction. 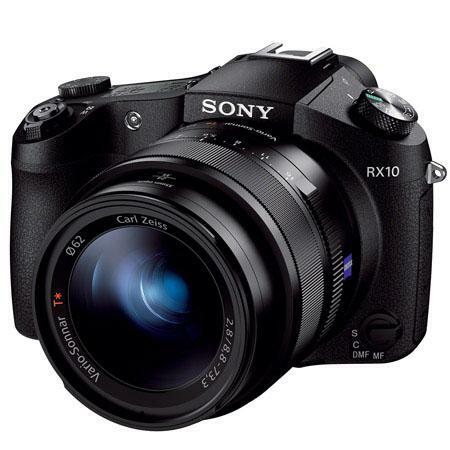 The RX1, like the RX100, charges via micro USB and uses a very small battery., NP-BX1. This is fine for running a camera without a focal plane shutter, though pushing it for capacity when running the larger RX1 with EVF (you need spares). The A7 models have a large finger grip partly to accommodate a more substantial battery. The tiny NP-BX1 is really a consumer compact camera cell. The NP-FW50 used by the A7 models is the same cell used by NEX and Alpha 55 (etc). A battery grip VG-C1EM accepts two of these cells for extended shooting. Charging remains in-camera despite the battery size, as with the Alpha 3000, the first camera to charge this battery type via USB. However, there is an external battery charger available. As this image, released in the early hours of the morning, shows it’s a bridge camera with an 8.8-73.3mm f/2.8 lens which is equal to 24-200mm on a 1″ sensor (2.7X factor, 2:3 format shape). This is the spiritual heir to two cameras – the Konica Minolta A200 and the Sony Cyber-shot DSC-R1 – rolled into one. The A2/A200 was described as having a 28-200mm lens, but because it had a 4:3 format shape, the lens was actually equal to a 24mm if you wanted an 8 x 6″ print shape (the 28mm equivalent assumed you cropped the frame down to 2:3… not many people know that…). And that camera had a 7.2-56mm lens, which tells you that the 2/3 inch sensor is for some reason more like a 3/4 inch sensor relative to the 1″ standard. The RX10 has a mechanical zoom just like the earlier Minolta/KM and Sony models. As long as the lens lives up to expectations, it’s going to be a great general purpose camera, with its 1/3rd click stopped aperture ring round the lens and its Alpha style mechanical AF mode switch. Why would you really want anything more than this for 90% of your out-and-about photography? It has Nearfield (NFC) connectivity but does not have WiFi, or GPS built-in. It does have the Multi Function Accessory shoe which can add many accessory functions in future. One surprise is that this camera has a mini XLR balanced powered adaptor kit for microphones – this is the small XLR you may have seen on wireless mic sets, locking and more secure than the minijack which is built-in for regular use. This also has audio level metering and manual gain control (thus beating the Alpha 77, which remains hampered by forced auto gain for audio). All the new Sony models have improved sensors and processors. The A7r has the microlenses moulded directly to the sensor, rather than added in an overlay layer as it normal, and they are gapless. 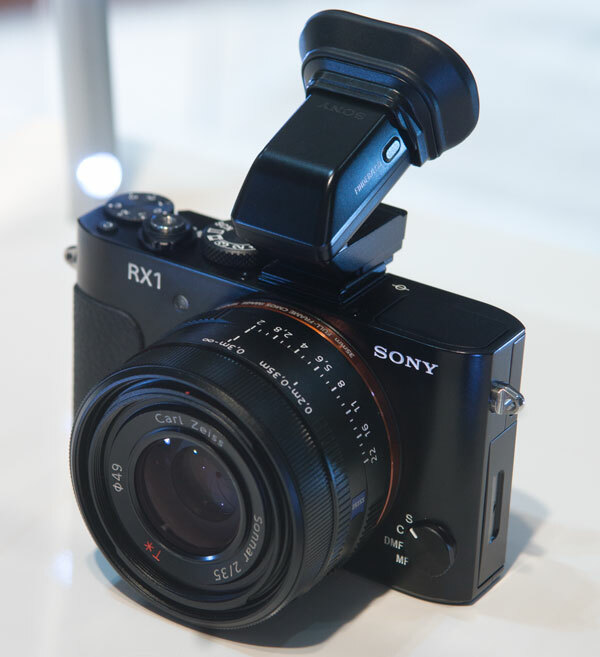 The RX10 has a back-illuminated sensor. All have ‘local noise reduction’ which sets alarm bells ringing. If it’s a function that only affects JPEGs, all very well; if we have adaptive local NR affecting raw files, it will only be acceptable if it can be turned off (at least, to some users).